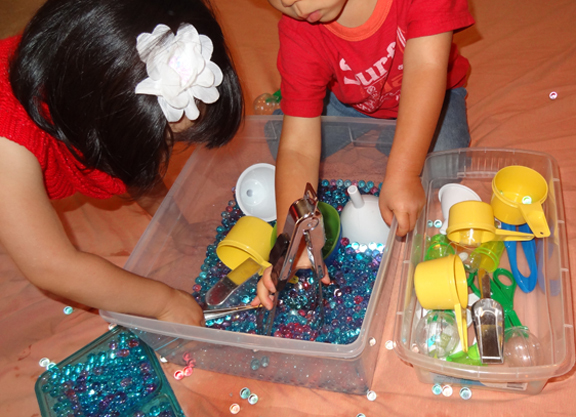 My kids love sensory bins and all kinds of sensory play experiences. 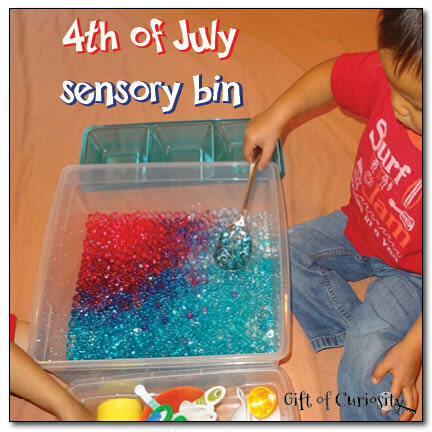 So with the approach of the 4th of July holiday, I knew I wanted to create a 4th of July sensory bin for my kids to enjoy. Of course I wanted it to be patriotic. I also wanted it to be fairly simple to prepare. 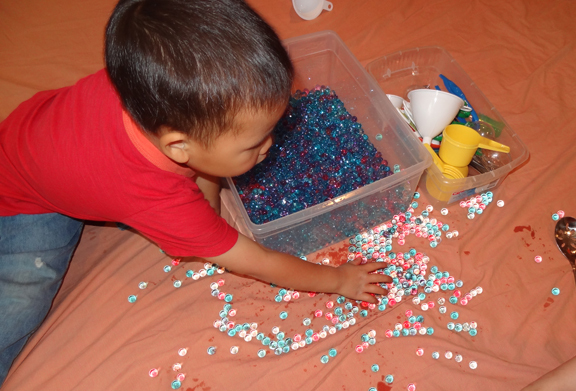 Ultimately I came up with a patriotic sensory bin that was a bit hit with my kids! 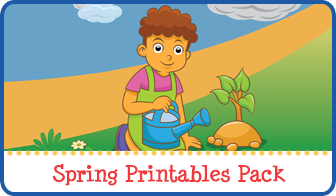 Note: For more 4th of July activities and printables, see my 4th of July activities page. The clear water beads are difficult to see because they take on the color of whatever is around them. After helping me lay a large sheet on the floor (to help with clean up), the kids dove right in to the bin using the materials I set out for them. 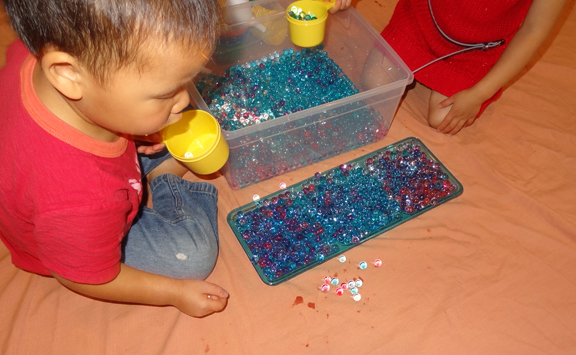 I explained that this was our 4th of July sensory bin, which is why the water beads were red, white clear, and blue. We also talked about how these were the same colors as the colors on the American flag. Their favorite material was this three compartment plastic tray I recently added to our collection. 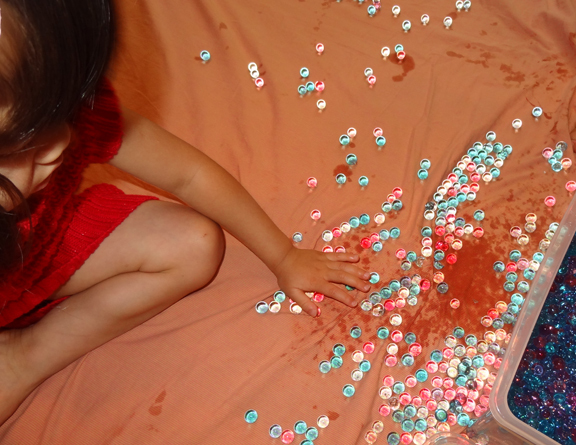 Once the tray was full, some beads began to spill on to the floor. 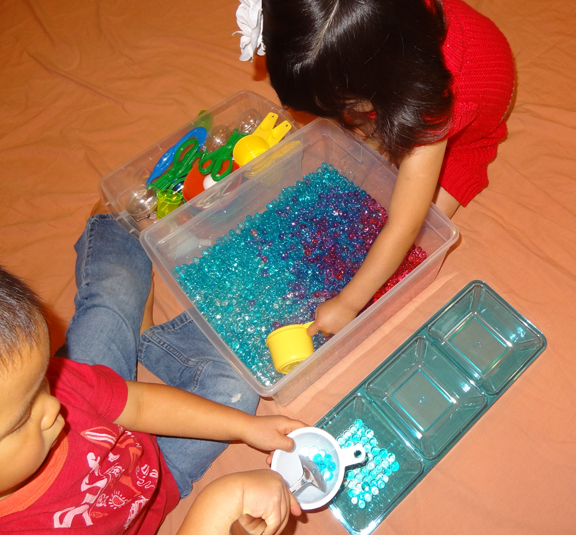 Before the water beads had spilled the kids had been using the scoops and spoons and such to pick them up, but once the beads were on the floor QBoy and XGirl began to use their hands to enjoy the wonderful sensory experience. 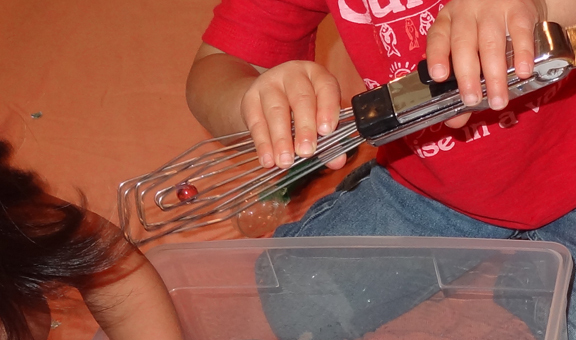 I stepped out for a minute to take care of something, and when I came back, QBoy had put a lot of our sensory bin supplies in the bin, and he was busy using a pair of tongs to try to pick the water beads up. Much to my surprise, he actually managed to snag a water bead in them! 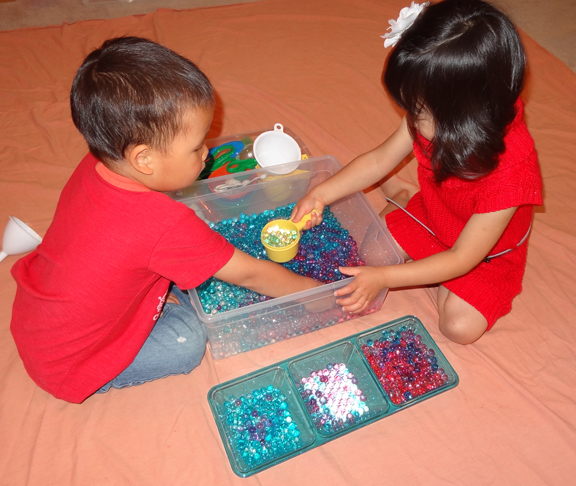 And that is how we had fun with our 4th of July sensory bin. 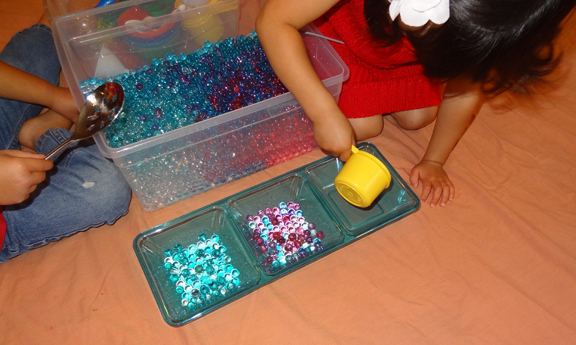 I invite you to check out other sensory play ideas on my Sensory Play page and my Sensory Play Pinterest board. 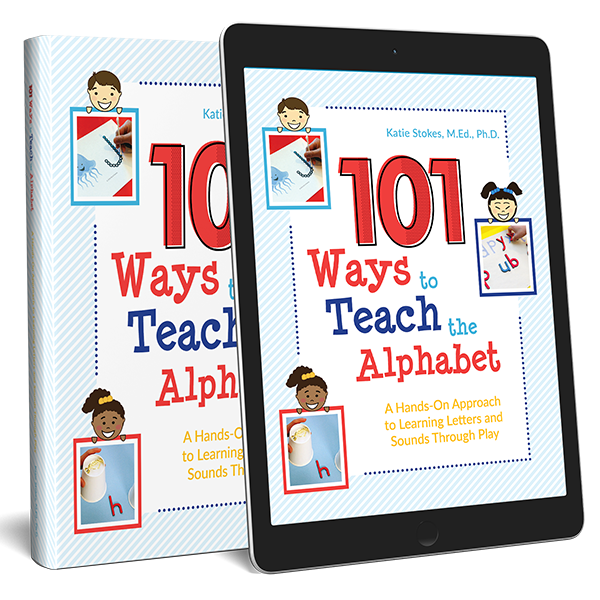 I think my preschool class would love this! That is a cute and festive sensory bin. Please stop by and link this to Artsy Play Wednesday (now live). 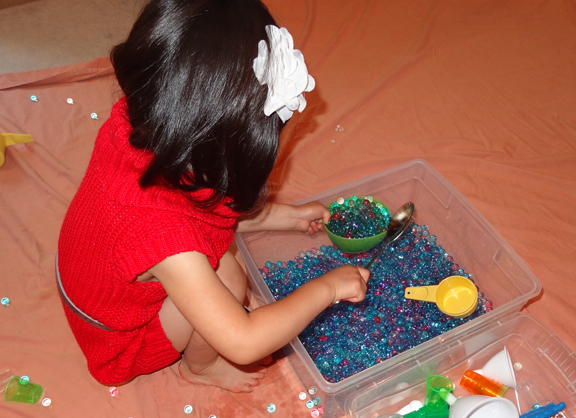 Mine love water beads! My little guy likes to throw them and watch them bounce! The colors in this bin are lovely; thanks for sharing at Mom’s Library! 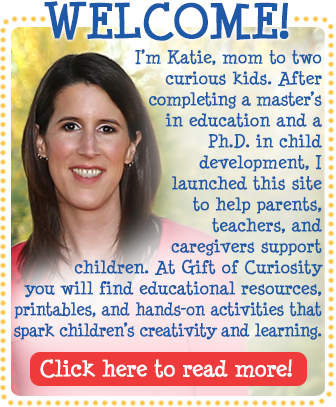 featured you this week on moms library! 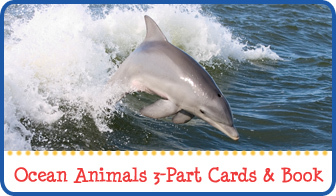 Featured you this week on Mom’s Library!! Looks like a lot of fun!! Thank you for sharing at Sharing Saturday! That looks like so much fun! Stupid question of the day though – where do you get water beads from? Hi Clare, I buy my water beads on Amazon. 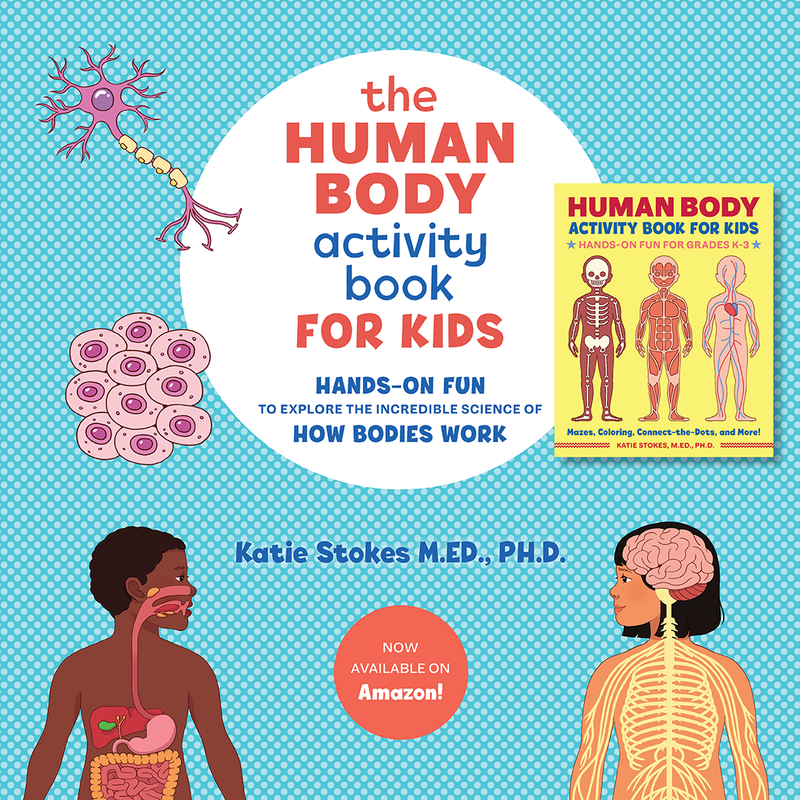 Here is a link to the product I purchased. 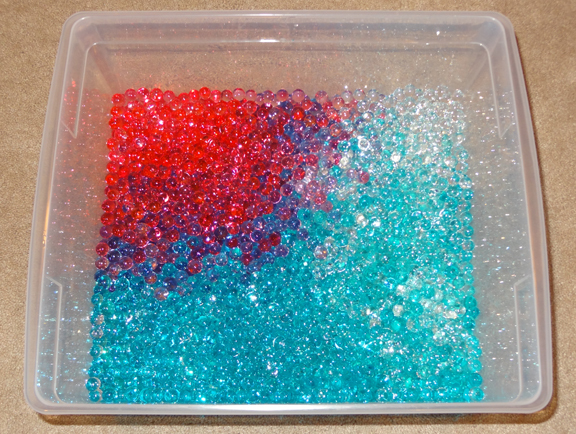 A question about dying the water beads…I have water beads that are tiny and you add water so they expand. I’m not sure if there are other beads, perhaps. To dye the beads, are you dying them after they have expanded? Also, does any of the dye come off on your hands? I’d love to try this with my kids. I add the dye to the water, so as the beads take in the liquid they are getting dyed at the same time.